Before the Spill is a film about Line 5, its risks, and the best path forward. As we sat on the tailgate of the truck, our breath swirling under the light of a headlamp, we heard the first distant thud of rubber on dirt. The approaching runner was still a mile away, but you can hear anything that happens in the stillness of 2 a.m. in the desert. Sound carries in the dark. After President Trump’s decision to eliminate the most federally protected land in American history, we wanted to see it before the land officially opened to extractive industries. 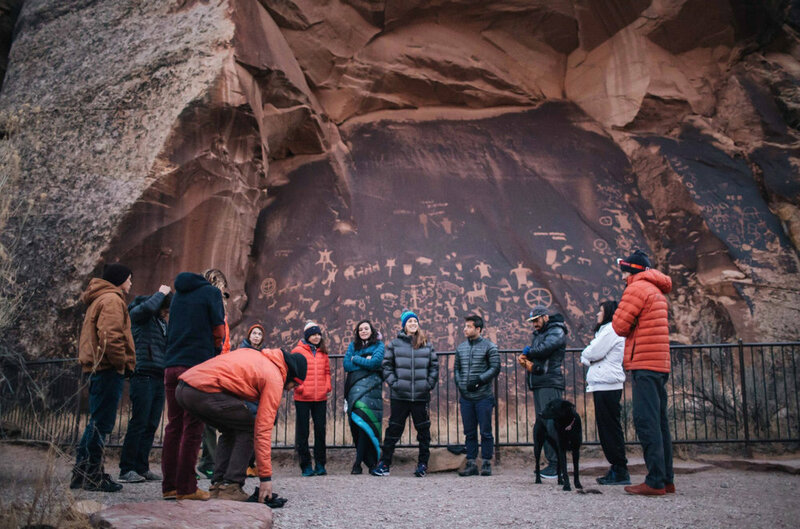 Messengers is a film about a 250-mile running relay across Bears Ears and Grand Staircase-Escalante. After the indigenous people prevented marble miners from destroying their sacred limestone mountains they began searching for way to protect them forever. We visited Mollo in 2017 to learn about the community and assess the potential for a new crag. Working with local non-profits we plan to return to establish the new climbing area, which will be owned and operated by the community and provide a steady source of revenue without exploiting the land. Walls of Mollo is a film about this project. The unexpected can't exactly be planned for, but when you decide to bike from San Francisco to Alaska with your best friends in just eight days, you can bet that not everything will go according to plan. This grueling, lofty goal was self-induced, self-planned and a totally authentic experience of people looking for adventure. 3,300 Miles To Go is a film about our ride, the friendships built, and the misadventures along the way. On May 28th, 2018, three kayakers left Havana, attempting to kayak across the Straits of Florida to the United States, in solidarity with refugees and immigrants. After 27 hours and 12 minutes of nonstop paddling, they landed in Key West, Florida. The paddle spanned 125 miles of exposed and unpredictable ocean, from Havana to Key West. The Gulf Stream runs across the route. The three kayakers saw strong winds, rain and waves up to 10 feet high. Before them, thousands of Cubans have attempted to paddle across the Straits of Florida in the last five decades, all undocumented. Kayak Libre is a film about kayakers using their sport to connect, pay homage to the tragic history of the crossing, and advocate for continued open borders. The idea began in San Francisco with a small group of friends who were tired of running races and hungry for a new flavor of adventure. They wanted to challenge themselves while exploring unfamiliar landscapes, and they wanted to share those experiences with their best friends — and so the Love Bus was born. The Love Bus is a film about a 330-mile relay around Hawaii, and the joy it brings the group of friends. Also known as Love Bus 5, this short features a group of friends relaying the last leg of the Oregon Trail, which sprawls 500 miles across the state of Oregon, from the Snake River crossing to Oregon City. It's an ode to running and proves that sometimes the best way to see a landscape is on foot.